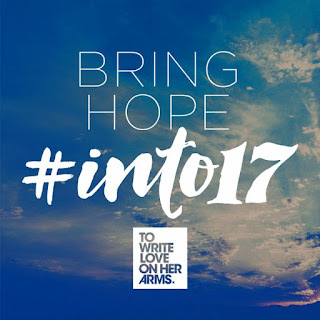 In honor of Giving Tuesday Nov. 29, To Write Love on Her Arms (TWLOHA) has launched its brand new "#into17" campaign. The month-long giving campaign aims to raise $100,000 by midnight on Dec. 31, which will help TWLOHA share a message of hope with more people than ever before in the new year. To participate, join the conversation using #into17 or donate to the Classy fundraising page. "We want to meet 2 million people with the message of hope and help at 150 events and festivals across the country. We want to support hundreds of people's journey of treatment and recovery and connect thousands to local mental health resources. To Write Love on Her Arms is a nonprofit dedicated to presenting hope and finding help for people struggling with depression, addiction, self-injury, and suicide. TWLOHA exists to encourage, inform, inspire, and also to invest directly into treatment and recovery. Since its start in 2006, TWLOHA has donated over $1.8 million directly into treatment and recovery and answered over 200,000 emails from over 100 countries. Over the past ten years, TWLOHA has been heralded by press and seen on NBC Nightly News, CBS Sunday Morning, MSNBC, Rolling Stone, Paste Magazine, Relix, US Magazine, Glamour, Yahoo!, The Huffington Post, The Chronicle of Philanthropy, NYLON Guys, MTV, Elle, NPR, and so many more. The organization has seen support from numerous celebrities including actress Jessica Chastain, actor Jared Padalecki, Miley Cyrus, Liv Tyler, Joaquin Phoenix, actress Sophia Bush, singer/songwriter Mat Kearney, USA soccer stars Alex Morgan, Ashlyn Harris and Ali Krieger, singer/songwriter Christina Perri, rock band Switchfoot, pop rock act The Summer Set, Hayley Williams (Paramore), among others. This past September, TWLOHA wrapped its 5th annual campaign to honor National Suicide Prevention Week and World Suicide Prevention Day. The organization was overwhelmed by the amount of love and support shown during this year's campaign, titled "And So I Kept Living,"which, thanks to the help of supporters all over the world, raised more than $98K for treatment and counseling.